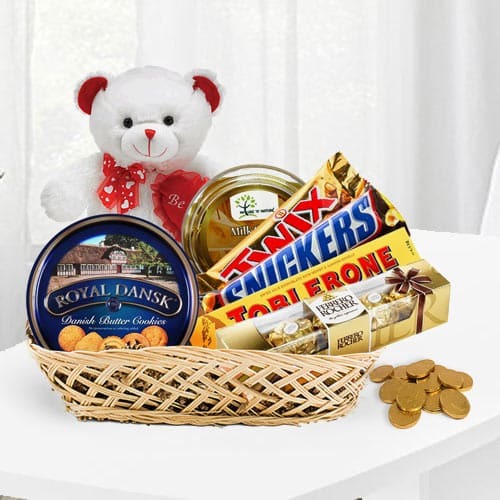 Add sweetness into your relationship by sending people close to your heart this Yummy Cookies N Chocolate Gift Basket that is sweet as your pure love. This Chocolate Basket is the perfect Gift for any Chocolate lover as it is combined with Danish Butter Cookies, Ferrero Rocher 4 pc, Twix, Snikers, Toblerone, small Teddy and a box of Golden Coin Chocolates. All these items are placed in a tray.